The Further Adventures of Benayr Australian Terriers! Thanks go to Bob and Mary!! Bob and Mary Russell of Maine have become the new retirement home of two of our favorites! Ch Benayr Mr Wonderful and Ch Benayr Girls Rule are now at home with them, preparing to enjoy life in Maine. Thanks so much to Bob and Mary! Welcome to my blog! Check here for updated information about our dogs and puppies as well as tips on care and show information. River swept through Phoenix in March and completed his championship start to finish in 5 days. 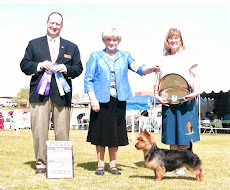 He was Best of Breed on Thursday at Sun Country Terrier Club and was also first in the Puppy Sweepstakes Group and first in the Bred By Exhibitor Group. What a fun dog to show! He is a true natural as this was his first dog show weekend! Ch Benayr My Rose Royce! Rosie finished her title on May 30th at Spokane KC. She is the third champion for her dam, Ch Benayr Hello Gorgeous. Dog crazy, that's me! A lifelong interest in dogs and dog shows describes me. I live a quiet rural, retired life with my husband of 50 years. Our Aussies are our buddies and bring hours of joy and entertainment. When you get to know an Aussie, you will know what I mean!